Cattle body condition scores, or BCS, are a quick way to gauge your cattle's body fat levels. Every cattle farmer (grass-fed or otherwise) needs to know how to guage BCS to increase their beef cattle fertility. BCS is also an essential winter grazing tool to monitor cattle weight to keep it within safe weight range limits. and monitor growing cattle so that their growing bone and muscle mass is not compromised by insufficient body fat during the winter grazing program. In this article I will teach you about cattle body condition scores. I'll show you how to use BCS as an essential beef cattle management tool to help prepare your cattle herd for a winter grazing and then how to use BCS to monitor your cattle throughout the winter grazing season to guarantee that their body fat levels never drop below the safe range. A butcher can measure the fat content of a beef carcass very precisely. A vet can gauge body fat very closely by taking a series of measurements while the cattle are restrained in a cattle squeeze. And your livestock nutritionist can calculate how your cattle's body fat levels will change over the course of the seasons based on your forage quality. While each of these methods are important, you still need a systematic way of gauging body fat levels out on pasture to monitor the health of your cattle, protect the fertility of your brood herd, and assess when your grass-finished cattle are ready for slaughter. You need to learn how to eyeball body condition in the pasture. The 9-point Body Condition Score scale is the perfect tool for the job. Cattle body condition scoring is done on a 9-point scale. Each number on the scale represents a specific amount of body fat. Too much or too little body fat is dangerous to your cattle's health and has dramatic effects on your beef cattle fertility. It's quite easy to guestimate body condition scores in the pasture based on things like how fat the flank looks, how many ribs are visible through the hide, whether or not the spine is protruding, how fat the brisket looks, whether the pin bones are visible, whether there are fat deposits visible around the udder, and so on. You can see a full explanation of each body condition score, along with a few diagrams to help you train your eye, on pages 38 and 39 of Grass-fed Cattle. I recommend that you photocopy these two pages and keep them with you in the field until you feel comfortable gauging the body condition of your cattle at a glance. Fluctuating body fat levels do not automatically mean that the cattle lose weight. Growing cattle may be gaining weight due to bone and muscle mass increases, even if their body fat reserves are depleted below safe levels. Make sure you work with a livestock nutritionist to ensure that your growing cattle are receiving enough protein and energy from your winter pastures to meet the demands of bone and muscle growth while maintaining safe body fat levels throughout the winter grazing season. The overview of the different body condition scores below is meant to illustrate how changes in body fat directly affect the health and fertility of your cattle. You need to understand this direct correlation between body fat, health, and fertility in order to safely graze cattle during the winter months. A body condition score of 1 to 3 represent different stages of emaciation. You should never let your cattle get this thin. Cattle that loose this much weight are tapping into reserves that will stunt future growth and fertility for years after they recover. This much fat loss posses a serious health risk to your cattle. Pregnant cattle are also at risk of aborting their foetuses if they get this emaciated because the demands of pregnancy and future lactation will put the mothers' chances of survival at risk. A body condition score of 4 is borderline too thin. Farmers should increase feed supplementation or switch to a cattle feed ration before their cattle reach a BCS of 4. Cattle that reach a Body Condition Score of 4 during the winter season will suffer reduced fertility in the next cattle breeding season even if they regain all their lost body fat again before calving! More on the correlation between fertility and body condition below. A body condition score of 5 to 7 is the optimal body condition range for cattle. A typical mature cow with a BCS of 5 is approximately 180 lbs lighter than when she has a BCS of 7. This is the normal safe weight fluctuation that adult cattle can experience over the course of the year. By supplementing themselves with the fat on their backs gained from all the cheap excess pasture in the summer, your cows can safely lose body fat down to a BCS of 5 during the winter. But your cattle should regain a BCS of 7 prior to calving to ensure maximum fertility in time for breeding. A BCS of 7 at calving ensures that the high energy demands of calving and lactation won't negatively impact fertility during the upcoming cattle breeding season. Likewise, growing cattle can also reduce their body fat levels within this range (BCS of 5 - 7) during the winter grazing season as this ensures they maintain sufficient body fat to support healthy bone and muscle mass growth. 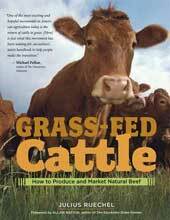 In the Grass-fed Cattle book, you will even discover that this reduction in body fat is essential for growing cattle at certain stages of their growth in order to ensure maximum fertility when they reach adulthood. Just like being too thin (BCS of 4 or less) is unhealthy, there are times during young cattle's lives when a body condition score of 7 is simply too fat for healthy development. This body fat range of BCS 5 to 7 is the holy grail of grass-fed beef production. It is the secret to lowering feed costs in a grass-fed winter pasture rotation. It is the secret to maximizing beef cattle fertility in your breeding stock. And it is the key to ensuring healthy growth in your growing cattle. In a cow/calf herd this safe fluctuation in body fat reserves is only possible if you calve during the growing season to give the cows time to fatten up to a BCS of 7 before calving. When calving is not timed so it occurs during the growing season, farmers cannot allow their cattle to supplement themselves off the fat on their backs during the winter because their cows will not have time to fatten up again before they calve. This means higher feed costs. Cows with a BCS of 5 at the time of calving will still be perfectly healthy, but their fertility will be dramatically reduced at breeding time because of the high energy demands of lactation. Only cattle calving during the growing season can safely lose body fat during the winter without affecting their fertility in the next cattle breeding season. This is the key to reducing your overall feed costs in your cow/calf herd. A body condition score of 8 or 9 is obese. Cattle with a BCS of 8 or 9 are so fat that the excess fat is taking a toll on their health and fertility. Cattle that are fatter than a BCS of 7 will see their fertility decrease and are at risk of a variety of other health complications, including foundering from an overly rich diet. In the normal course of a grazing program, cattle rarely if ever get to a BCS of 8 or 9 on pasture. However, a Body Condition Score of 8 or 9 is more common in confinement feeding situations in which cattle are given high-energy cattle feed rations, often fed free-choice, combined with boredom from the lack of stimulation in the feed area, which leads to overeating. This risk is further compounded by a lack of exercise in feed pens as the cattle wobble back and forth between a feed bunk and bedding area separated by only a few feet. Cattle need a certain minimum of body fat in order to be fertile. However, beef cattle fertility is the last thing to recover after a period of weight loss. If too much body fat is lost over the winter the cattle will not completely regain their fertility in time for next cattle breeding season even if they have regained all of their body body fat. Or, to put it another way, beef cattle fertility is only possible when your cattle's health is optimal. Letting cattle reach a BCS of 4 puts too much stress on the cattle's health, which in turn reduces the cattle's fertility during the next breeding season. This tight correlation between beef cattle fertility and body condition at calving is a smart survival adaptation. In the normal seasonal pattern of feast followed by famine, growing season followed by winter or drought, it ensures that cattle breeding is timed so calves are born when both mother and calf have the best nutrition available to support lactation. Without expensive cattle feed rations, calving outside of the growing season puts both mother and calf at risk of starvation because of the high energy demands of lactation. This strong correlation between fertility and body condition at the time of calving also ensures that if there is a prolonged drought the cows will remain infertile until the drought ends - again to protect both mother and calf. Calve during the growing season so that the cow can use cheap pasture to reach a body condition score of 7 in time for calving, thereby ensuring maximum fertility at breeding time and ensuring that the cow can easily meet the high demands of lactation from the nutrition provided by the cheap pasture. Timing your calving season during the growing season allows your cows' body conditions to fluctuate naturally between a BCS of 5 to 7 over the course of the seasons, thereby dramatically reducing your beef cattle management costs as the cows use fat stored from the cheap summer pastures to supplement the quality of their winter pastures. By monitoring BCS during the winter, combined with a calving season scheduled during the growing season, you can have your cake and eat it too. Your cattle's fertility is maximized, yet you can benefit from the significantly lower production costs of a winter grazing program because you can safely allow your cattle to supplement themselves from the fat on their backs during the winter pasture rotation instead of having to maintain your cattle on high energy cattle feed rations throughout the winter. Weight loss causes metabolisms to slow down. Once food becomes plentiful again in the spring, it takes a while for the metabolism to catch up. This delay allows cattle that have lost body fat during the winter to re-gain body fat with incredible efficiency in the spring, allowing them to quickly 'catch up' with cattle that did not lose weight during the winter. This delayed metabolic response and increased weight gaining ability is called compensatory gain. Body condition scoring allows you to monitor your cattle's body condition throughout the winter in both your adult and your growing cattle so they remain within the safe body fat range of BCS 5 to 7, allowing you to safely capitalize on your cattle's compensatory gains when your pastures resume growth in the spring. It's a key component to reducing your beef production costs. You can learn more about how to raise cattle and how to use compensatory gain and body condition scoring to reduce your beef production costs, as well as see diagrams of different body condition scores to help you train your eye, by reading "The Cattle Year on Grass" chapter of Grass-fed Cattle. If your cattle have experienced some event, like a prolonged drought, which you fear may impact their fertility in the upcoming cattle breeding season, or if your cows and/or heifers did not re-gain a body condition score of 7 prior to calving, there are a number of tricks you can use to temporarily boost fertility in your cow herd. These techniques are also useful if you are moving your breeding season forward to adjust your calving season schedule, in which case you may not be giving your cows the normal required time to recover after calving before they are bred again. These techniques will help you temporarily boost your cows' fertility to overcome a less than optimal situation that may impact your herd's fertility. Veterinary methods such as hormone injections. This one is obvious, but may or may not be approved by your organic certification association and can be quite expensive. Turn the cows and/or heifers into a particularly lush pasture a week or so before breeding so that they get a dramatic boost in energy just prior to breeding. Or feed a high-energy feed supplement to achieve the same sudden spike in nutritional energy (conventional farmers will often use grain for this purpose). The sudden high-energy surge in their diet provides a temporary boost to their fertility. It should therefore be done just before breeding. Be careful using alfalfa or clover pastures for this purpose - some varieties are high in oestrogen, causing a flood of oestrogen in the cattle's diet which will actually reduce fertility. This word of caution highlights one of the risks of why all these fertility-boosting techniques are stop-gap measures to solve a temporary situation, but should not be adopted as standard practices to be used in your normal course of operations. Raising Beef Cattle on Grass - Learn how to raise cattle that are suited to your grazing conditions. Grazing Management Summary - a handy stripped-down reference list of the seven Core Grazing Rules that anyone raising beef cattle needs to know in their sleep. Or, return to the article index on the Grazing Strategies main page.